. Published on November 15, 2018 . Chicago is a city of opportunity. New York and Los Angeles require either significant money or one hell of a personal network to get a creative endeavor off the ground. It’s been both my experience and my belief that, with tenacity and moxie, you can make it happen here. 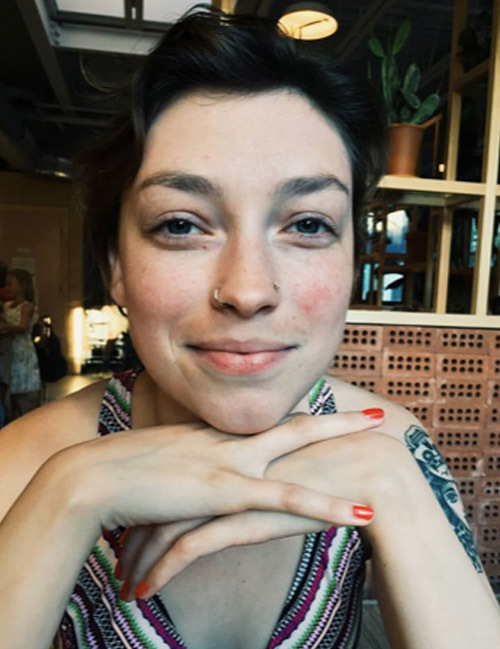 Case in point is Vanessa Ramstack (MFA in Poetry, ’18). Vanessa is the coordinator of the Chicago edition of the New Sh!t Show, a national reading series of established and up-and-coming writers who also perform. Vanessa found a Chicago home for the series, she curates the monthly readings, promotes and emcees the event. 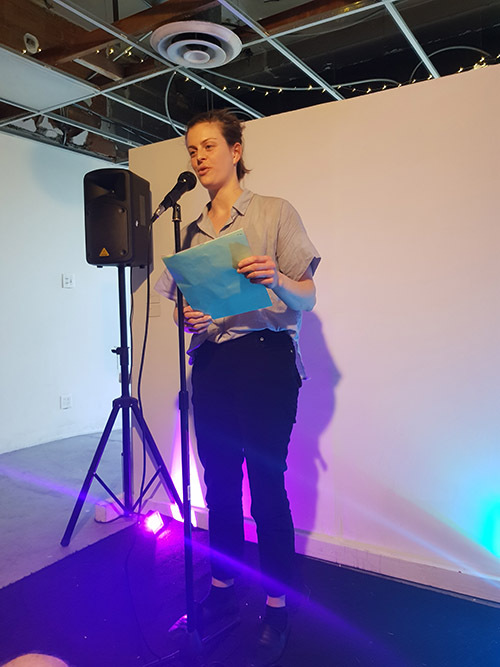 Vanessa moved to Chicago in 2016 to pursue her MFA at Columbia College Chicago, and as serendipity would have it, another Minneapolis friend, Ben Kernes, had just set up shop in Humboldt Park with his partner Jenny Hargrave. Their space, Slate Arts & Performance, at 3203 West North Avenue, is a cozy, unassuming storefront in a hip neighborhood. The couple were more than happy to lend their space to Vanessa’s venture. Writer Leslie Buchheit outshines an amplifier. Chicago’s New Sh!t Show is young but growing fast. Vanessa promotes the show on social media and by word-of-mouth. The crowds can be sizable or intimate. On a Sunday night when I recently attended, there were four readers and ten audience members. It was a very personable experience. Thus far, the majority of the participants are people Vanessa met while studying at Columbia. She told me that she is always on the lookout for new talent, so check out the FaceBook page if you’re interested. Vanessa’s thesis advisor was Lisa Fishman. Vanessa told me that Fishman helped her to remember why poetry and creative writing are an integral part of the human experience. Other faculty who helped inspire Vanessa during her MFA experience include Tony Trigilio, David Trinidad, CM Burroughs, nonfiction professor David Lazar, and current MFA director Jenny Boully. Thanks to her warm personality, her belief in the creative arts, her experiences at Columbia, and two simple connections from back home, Vanessa is running her own ever-expanding event. She says she wants to inspire the sort of feelings in people that she felt while at Columbia. I think the New Sh!t Show at Slate Arts & Performance is the right venue to nurture just that type of thing. Come on down the first Sunday of each month at 8 p.m. and see what you think!